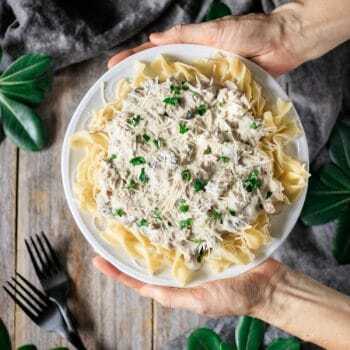 Creamy turkey stroganoff is an easy weeknight meal for families and kids. In under one hour, you can serve this simple comfort food for dinner tonight. It’s great for using up turkey leftover and gravy from Thanksgiving and Christmas. Make it in your skillet and serve over noodles for a winning dinner every time. This post was originally published on September 29, 2017. 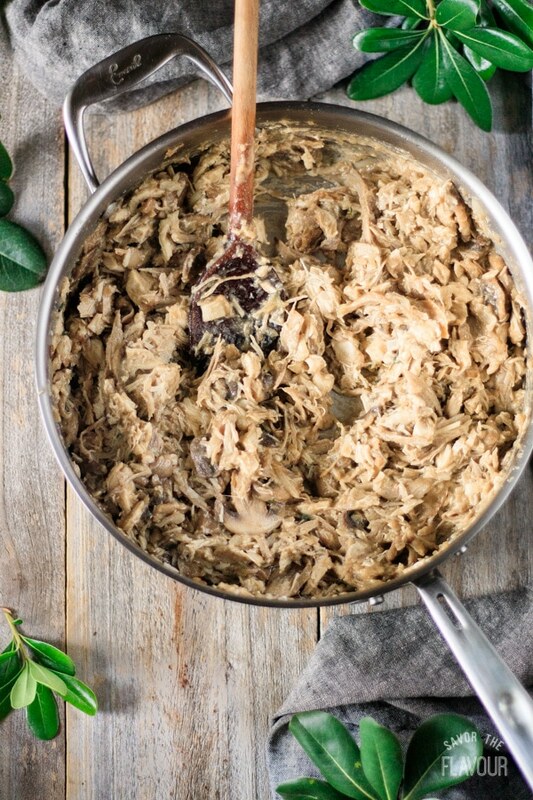 Turkey stroganoff is a fantastic way to use up leftover turkey. 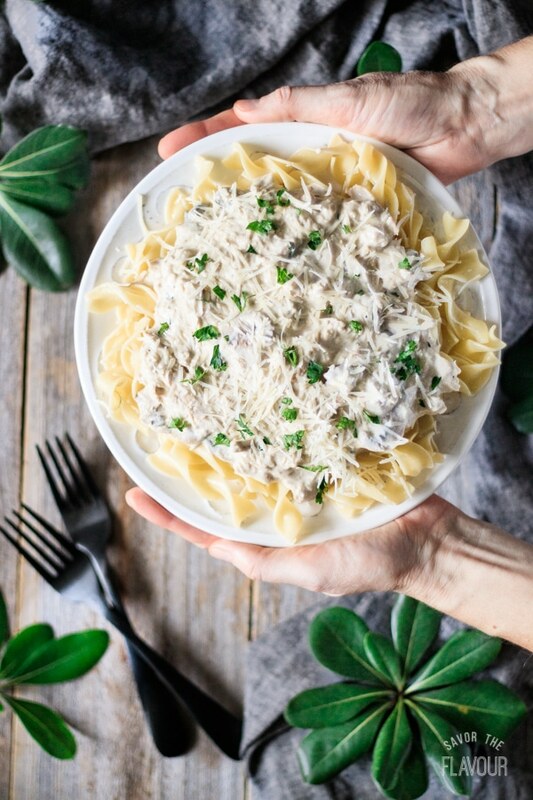 This recipe is loaded with flavorful ingredients like garlic, onion, mushrooms, thyme and savory, but the secret ingredient is using up your tasty leftover turkey gravy that has been reduced. Plan ahead and reserve some of your gravy from Thanksgiving or Christmas to use to make this amazing comfort food. What spices are used in turkey stroganoff? 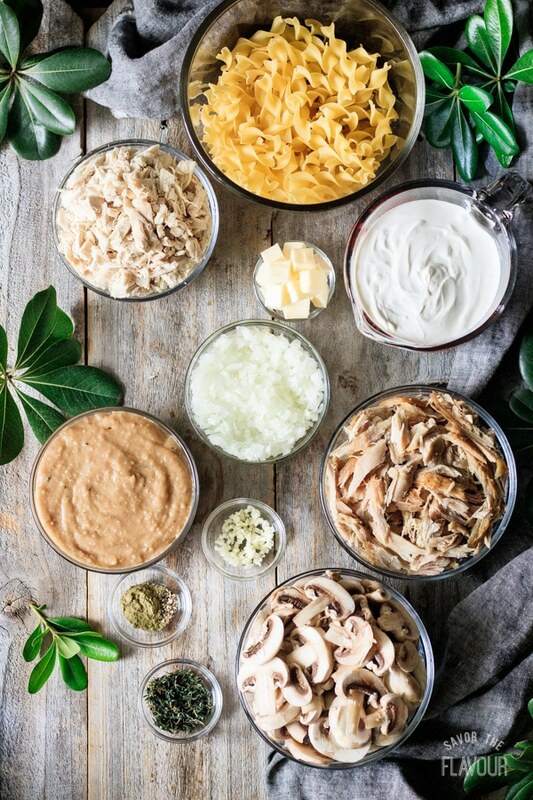 What is turkey stroganoff served with for dinner? 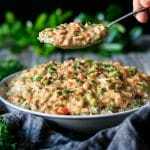 It is most commonly served over egg noodles or other pasta, but rice and mashed potatoes would also be excellent choices. Serve with a fresh green vegetable side like beans, broccoli, peas, or a crisp salad. 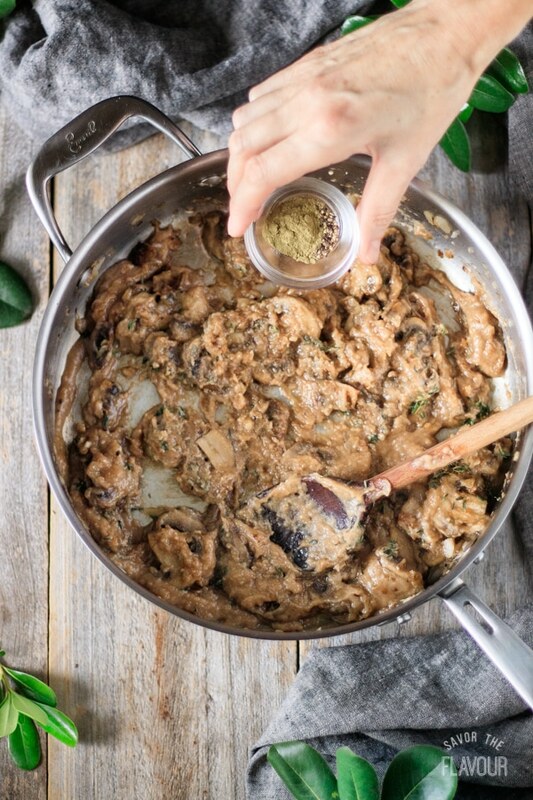 How do you make a stroganoff sauce? 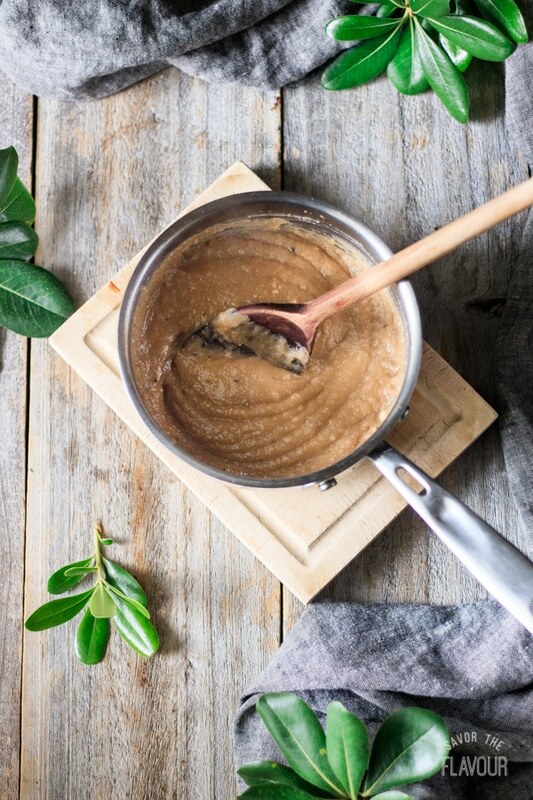 For this easy recipe, you don’t need to make a traditional white sauce with a roux. 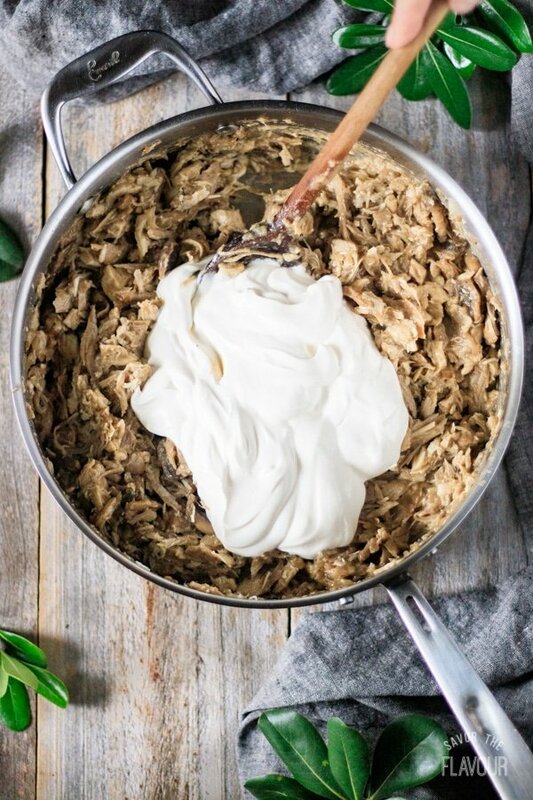 Simply remove the turkey mixture from the heat and stir in the sour cream, then adjust the seasonings. The sauce is super quick and delicious. Gather the ingredients. Measure your spices, egg noodles, sour cream, and leftover gravy. Chop up the leftover turkey, separating the white and dark meat, slice the mushrooms, mince the garlic, and chop up the onion. 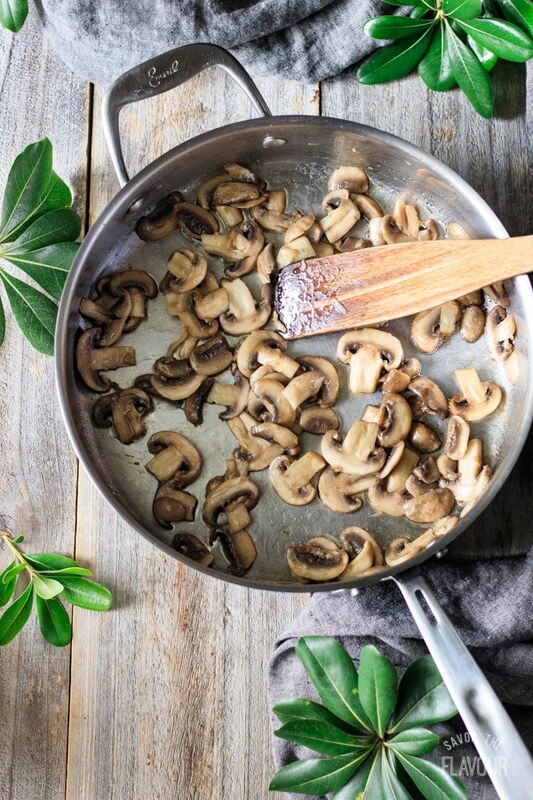 Saute the mushrooms in melted butter over medium high heat for a few minutes. Add the onion and cook for a few more minutes until it’s soft, then add the garlic and saute until fragrant. 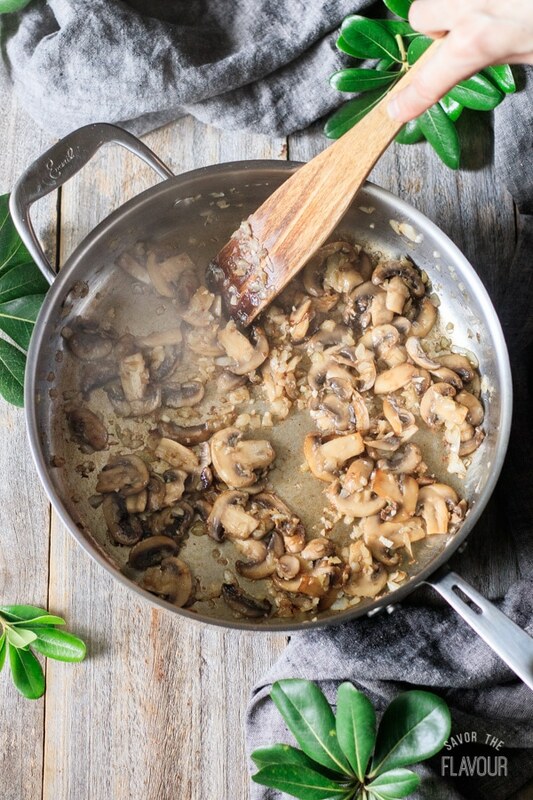 Reduce the heat to medium, then add the gravy and spices to the mushroom mixture. Stir in the chopped turkey, then pour in chicken stock or water to thin the sauce. Remove from the heat, and add the sour cream. Mix in the sour cream until thoroughly combined. Taste and adjust seasonings, adding more thyme, salt or pepper as desired. Serve over hot egg noodles. Garnish with freshly grated Parmesan cheese and fresh parsley. Don’t have leftover turkey? Use ground turkey or roasted chicken instead. Want to add veggies? Try green peas, broccoli florets, or red bell pepper strips. Want to reduce the fat? Use nonfat Greek yogurt. Want to make it low carb? Serve over spaghetti squash or zucchini noddles. Don’t have leftover gravy? Make some with equal parts butter and flour and chicken stock and spices. Want to reduce the sodium? Use unsalted chicken stock, and reduce the salt in the homemade gravy. Got leftover turkey? 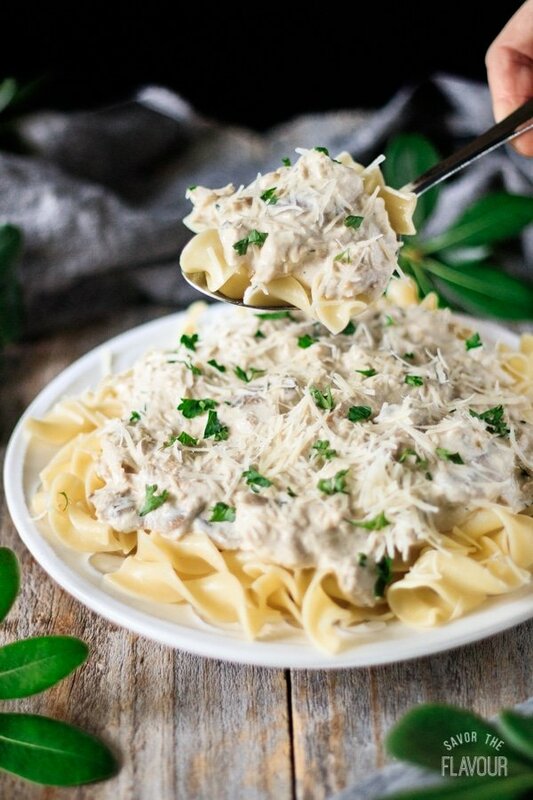 Creamy turkey stroganoff is a perfect recipe for using up leftover turkey. In under one hour, you can enjoy feasting on this classic winter comfort food. Why not make it for dinner tonight? 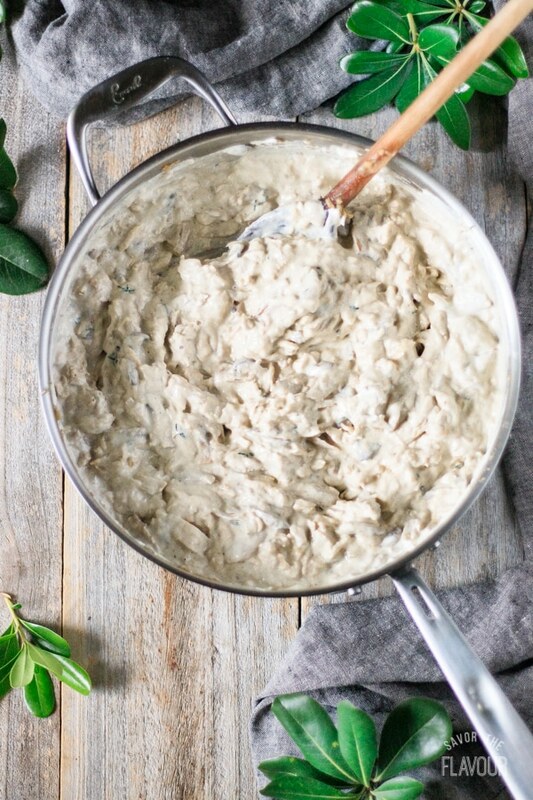 Use up leftover turkey with these other delicious dinner ideas. Skillet Turkey a la King: a simple home-cooked comfort food that dirties only one pot. Leftover Turkey Cranberry Brie Sandwich: a meaty twist on grilled cheese–perfect for lunch or dinner. Leftover Turkey and Sweet Potato Pasties: buttery puff pastry conceals a flavorful filling of turkey, cranberries, gravy, and sweet potatoes. 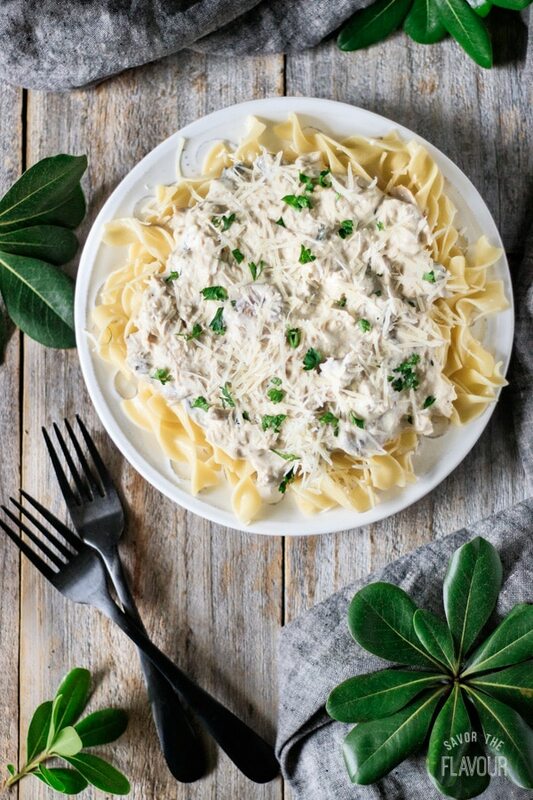 Did you like this creamy turkey stroganoff? Please leave a star rating below the recipe to share how you enjoyed it. Reduce the turkey gravy by boiling it down to intensify the flavor. Meanwhile, saute the mushrooms and onions in butter until soft. Add the garlic at the end and cook until fragrant, about 1 minute. Add the gravy and spices to the mushroom mixture and simmer for 5 minutes, then add the shredded turkey and simmer until heated through. Turn off the heat and stir in the sour cream until well mixed. Stir in the chicken stock or filtered water a little at a time to thin the sauce as desired. Adjust the seasonings by adding more salt, pepper, or thyme to taste. Bring a medium-sized pot of salted water to a boil, then add the egg noodles and cook according to package directions. Drain and rinse the noodles, then toss them with a little olive oil so they don’t stick together. Grate the Parmesan cheese. Rinse the parsley, then pat it dry with paper towel and chop it finely with a sharp knife. To serve, spoon 2/3 cup of sauce over a pile of egg noodles. Garnish with fresh parsley and freshly grated Parmesan cheese. Serve warm.